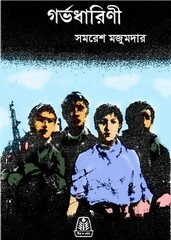 Barth in North Bengal and famous writer in Bengal- Samaresh Majumdar. So in many of his writings are involved about North Bengal. He is one of the leading fiction writer in Bangla literature, 'Kalbela', 'Kalpurush' and 'Uttaradhikar' are the best novels of his writing. Ananda Puruskar of 1982, recognition of his eligibility. Now readers can collect an another novel of his creation- Garvadharini, you can grab the pdf of this novel. The pdf has 387 pages, 44mb file size.